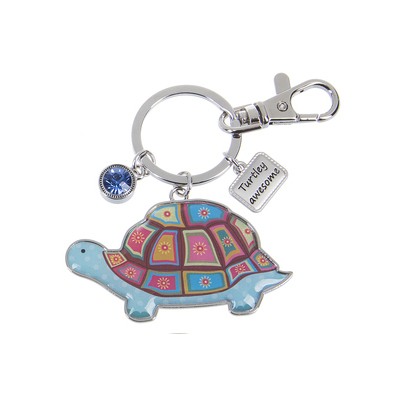 This adorable Ganz "Think Happy Thoughts" turtle key ring is made of sturdy zinc and is embellished with colored epoxy enamel. It has small mini dangling charm with the words "Turtley Awesome" and a blue crystal. These keychains make wonderful graduation and hostess gifts. Ganz Key Rings can be used on diaperbags, backpacks, purses and more.